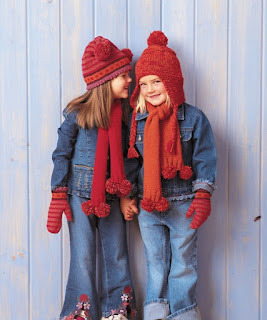 Keep kids warm and stylish in these cold-weather accessories, made from Patons Decor yarn. (For unisex appeal, you can leave off the pom-poms.) Either cap style works with the scarf and mittens to make one merry set. Hat and scarf: 20 sts and 26 rows = 4" in St/st with larger needles. Mittens: 21 sts and 28 rows = 4" in St/st with smaller needles. Check gauge before beginning work. Adjust needle size as needed to obtain correct gauge. Rep these 10 rows for Stripe Pat.